A1StereoControl is developed by Alex Hilton. A1Audio's new free A1StereoControl plugin promises to let you expand or limit the stereo width of your tracks using a single knob. It can be used on single tracks, groups or an entire mix - the only stipulation is that the material has to be stereo. The plugin also promises to keep bass frequencies centered to ensure that your music maintains its solidity and definition (you can set a level below which all frequencies are left in the middle of the stereo field using a knob). There are some 'advanced panning' features here, too. Head over to the A1Audio website to find out more. 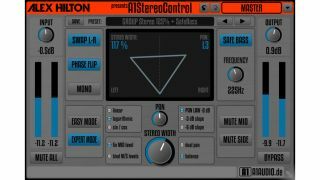 A1StereoControl can be downloaded for free in 32/64-bit VST/AU formats for PC and Mac.